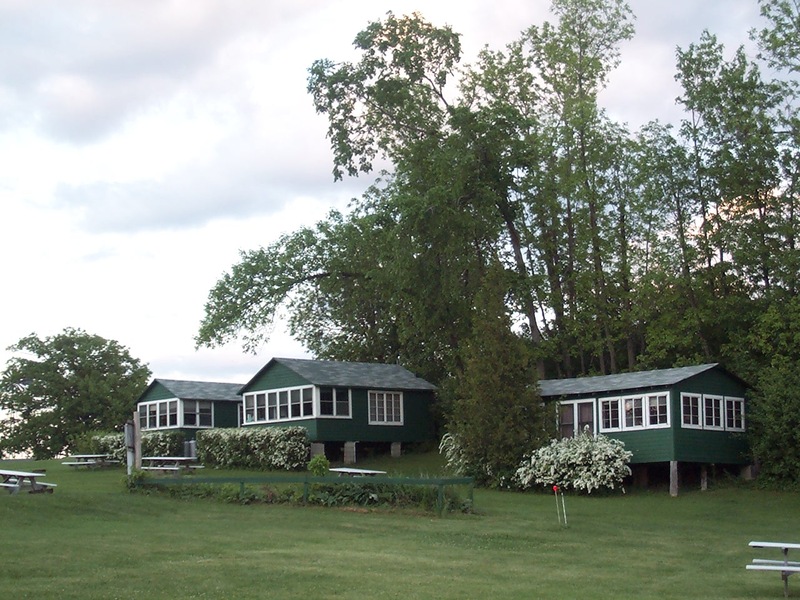 Our three rustic Hillside Cabins provide southern views of Lake Champlain from their kitchen and dining areas. 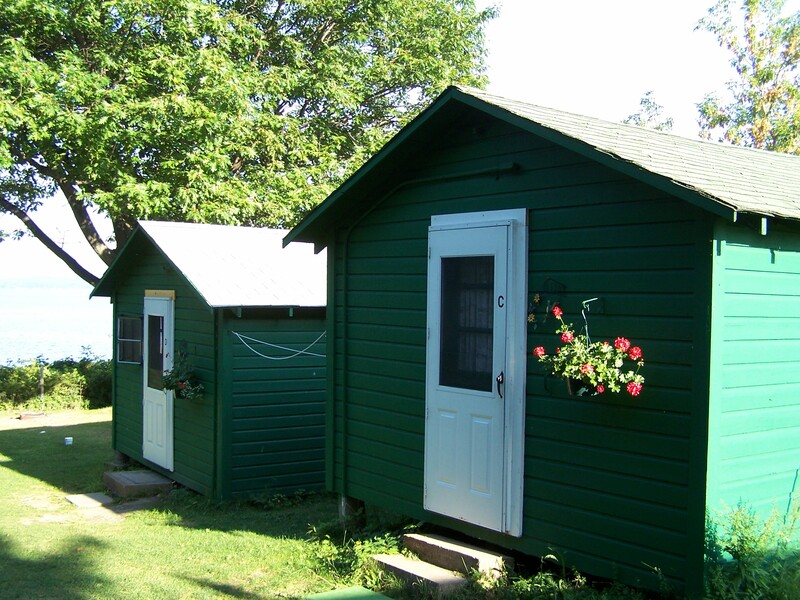 Depending on the unit, these cabins sleep from 4-5 guests; all have a double bed and additional twin or bunk beds. These charming cabins each include a private toilet, shower, and sink. Bed linens, pillows, washcloths and face towels are provided. However, you should bring your favorite bath and beach towels. Small dressers, hanging and shelf space are available for your clothes and personal items. Hillside Cabins are larger than the Cliffside Cabins and are perfect for a family vacation. 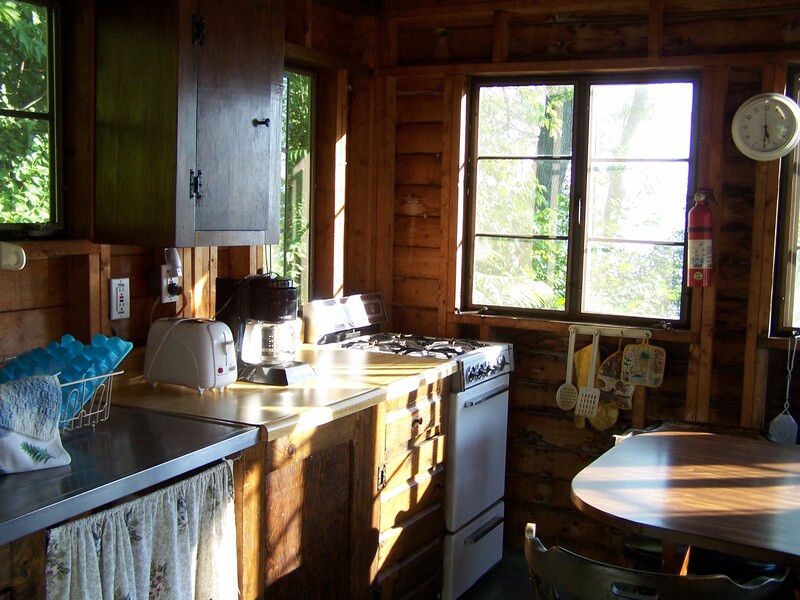 Each cabin has an eat-in kitchen with a full sized refrigerator, stove, and sink. Basic cooking needs are supplied (pots, pans, dishes, silverware). You may want to bring your favorite specialty cooking items. A picnic table and fire pit are outside each of the Hillside Cabins. You can park your vehicle just outside the door of your cabin. The weekly rental fee for a Hillside Cabin is $650, (plus 9% state tax) they typically rent from Saturday afternoon to Saturday morning, with a 10am checkout. Nightly rentals may be possible, if availability allows ($125/ nightly plus tax). Hillside 1 is closest to the lake (on the right in the photo above). Hillside 1 is the largest of the Hillside cabins. It has a full eat-in kitchen and a separate bedroom. A Double, twin and bunk beds allow this cabin to sleep 5 people comfortably. Hillside 1 Interior from entry door below. Hillside 1 bath area (with shower to the right, not in photo). Hillside 1 Eat-in Kitchen area. Hillside 3 is the smallest of the Hillside Cabins. It sleeps 4 comfortably and has all you need for a short or long stay at the lake. A fire pit and picnic table just outside make outdoor cooking easy. Private bathroom with separate shower and toilet room is perfect for a family. Hillside 3 also has matching twin beds. With a small but functional kitchenette, Hillside 3 has all you need to cook for a week or more. A refrigerator, gas stove and eating area along with dishes, pots, pans & utensils are provided. The bathing area of Hillside 3 is spacious with a sink and shower area, separated from the toilet stall. We provide hand towels and washcloths, please remember to bring your own bath towels and other toiletry needs. Our C and D combination unit is unique to our cabin accommodations in that we offer them as a pair. The C cabin has beds, shower, toilet and a small sink. A queen bed and 2 twins allow this cabin to sleep 4. D cabin has a kitchen, full size bed, a toilet and small sink. This rental is slightly more private in terms of the positioning on the grounds and offers two separate sleeping areas in one. Bed linens, pillows, washcloths and face towels are provided. However, you should bring your favorite bath and beach towels. Small dressers, hanging and shelf space are available for your clothes and personal items. Basic cooking needs are supplied (pots, pans, dishes, silverware). You may want to bring your favorite specialty cooking items. A picnic table and fire pit are outside. The weekly rental fee for C and D Cabin is $650, (plus 9% state tax) it rents from Saturday afternoon to Saturday morning 10am checkout. Nightly rentals possible, if availability allows ($125/ nightly plus tax).